Review: “Masquerade” is making a resounding success in South Korea, becoming the eighth film to surpass the ten million admissions, in October 2012. The plot tells the adventures of Ha-Seon, a common man who has been chosen to work as the double of king Gwang-Hae, the 15th ruler of Korea’s Joseon Dinasty. Ha-Seon was accustomed to work as a clown, making fun of the King and his court, hence no one better than him to temporarily assume the throne when the King fell ill due to poisoning. The humanity and honesty demonstrated by Ha-Seon, will conquer the queen’s heart, as well as the trust of the court men who were truly concerned with the country’s future. The costume design, scenarios, and resolute image compositions, were clearly the strongest elements in the film, whereas the plot revealed sentimental tendencies and a commercial appeal, very common in this genre. Its eagerness in combining mystery, humor, drama, and action, all at once, didn’t bring the expected results to make this epic more surprising or thrilling. 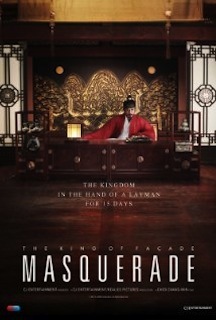 Lee Byung-hun’s performance, and a few funny dialogues and situations, made “Masquerade” entertaining but far from fundamental.